← Guest Post by Author Nicole Storey – Book Signings R Fun! I’ve been writing since a boy. I’ve always loved books and reading. Writing just seemed a natural extension of that. There’s always these ‘what if’ questions bouncing around my head that I need to bring to life. I entered some contests but don’t recall doing terribly well. I got serious with it about 10 years ago after friends told me that my emails of my travels were interesting and suggested that I take it further. Time is the obvious one. Unless you get a massive advance, you really can’t afford to write full-time. I had to balance having a full-time job as a teacher, writing my fiction and non-fiction books for education publishers and my novel-writing. My wife also needs some attention too. And that was before she announced she was pregnant (two days before I finished the first draft). That’s only the start of it. Then there were the assessments, the rewrites and the sending off to agents and publishers. Finally the waiting. And the waiting. And the waiting. In terms of research, I’d already done a fair bit of reading about the Rapture in general, demonology and swordplay, so didn’t have to do too much more in that area. I re-read Miyamoto Musashi’s Book of Five Rings. I re-read various passages in the bible looking for suitable quotes I could use. Getting the pacing and tone consistent. Sometimes there would be a few days (or weeks) before you’d come back to it and it felt like someone else had written it (because I’d obviously been in a different frame of mind). Finding the energy at the end of the day to sit down and write. Often I’d feel drained. It’s hard to work up the enthusiasm for a vigorous battle scene when you feel like that. Who designed the covers of the book? Cheryl Rowe who is the Art director for Pear Jam books. She designs the covers for all the titles and is amazing. All I said to her was that I wanted a guy in a hoodie, some flames and some Japanese swords and she did the rest. Was blown away when I saw it – and it was her first effort. Aside from some interesting facts about swords, demons, the Rapture etc, it was more about me learning how to write YA. I learnt that I could put pretty much all of the elements that I’d find in an adult fantasy book (think Game of Thrones), but just make it less graphic. I certainly didn’t need to dumb it down which I think some YA authors believe. I just find that condescending. Lots of my reviewers are in their teens and their reviews are insightful, thoughtful and intelligent. I can’t remember being like that as a teen though. From a design perspective, I think I would’ve liked to see the book with a slightly larger font. There’s a few minor editing changes that will be addressed in the next editions. Content wise – not really. Is there anything you find particularly challenging in your writing? Was there somewhere in the book you felt stuck? Some of the descriptive landscape scenes I found challenging. I’ve been to lots of places in the States but not Utah. I wanted it to sound and feel authentic so I had to do a lot of picture research. Google street view was amazing for that. And Google earth. I don’t know what writers did before they came along. I’ve been sidetracked from novel-writing lately. I just finished two non-fiction books (on forensic science) and two fiction books (as part of my Hamsterboy series) for Macmillan. I’m also working on a big educational project for Oxford University Press although I should have that finished soon. 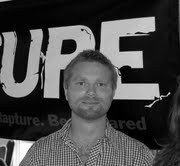 The second book in the Rapture Trilogy (Tribulation) is due around March 2012 and scheduled for release later that year. My publisher would also like the final book (Apocalypse) to be out at the end of the year but realistically, it’s looking more like 2013 with my schedule. Could you describe what happens in the next book in the series? Without giving too much away, it’s set around the mid-point of the Tribulation (about 3.5 years in). Things have got worse – a lot worse. More plagues, famines, natural disasters and general suffering. Against this backdrop, Sam is fighting his rear guard action. The Antichrist has arisen once more and has amassed an army (of humans and demons) which he plans to use to take over the entire U.S. Aimi…nah – can’t give too much away just yet. “Sam crouched in the gloom and waited for night to fall. He shifted restlessly, his body keen to be doing something – anything – other than wait. Waiting, however, seemed to be his lot during daylight hours. When your days were largely empty of anything other than meditation, eating and training, the excitement and action that came with nightfall were a welcome change. He was beginning to drift into his calm, inner meditative zone again when the building he was sheltering within began to shake violently. Instantly alert, Sam sighed and stood with one fluid motion, prepared to move if the building collapsed suddenly. He eyed the shaking walls warily, shifting his feet easily to accommodate the bucking floorboards. Most were already cracked and warped – testament to the amount of ground movement they had already been subjected to. Earthquakes were becoming more and more commonplace these days. They had been a fairly regular occurrence since the Rapture but lately, they had increased in frequency and power. Sam was almost blasé about them now but still treated them with a certain respect. Although not as susceptible to physical harm as normal humans, he was still conscious that he could be trapped under tonnes of rubble. The building continued to shake, the tremor building in intensity. Sam watched curiously as a long crack appeared in the wall opposite, moving like the fingers of a questing weed. A crash sounded somewhere from a back room and his hand unconsciously slipped down to grip the haft on his wakizashi tucked into his belt. When nothing emerged, he relaxed. Probably something shifting – not that there would be anything left on the walls. Any objects or photos that had once adorned the walls had long since fallen down. If this kept up, he reflected, he might have to move sooner than anticipated although he was loathe to step out into daylight. I’ve just finished reading Richard K. Morgan’s The Cold Commands which was great but completely the opposite of YA. In fact, I try not to read YA when I’m writing as it can influence my tone. I’ve just started reading Game of Thrones having just watched and loved the series. Once again, not appropriate for YA. It’ll probably take me a few months to read it as I’m so busy. I love computer games. Particularly turn-based strategy games. Unfortunately, they take a lot of time. Time which I just don’t have. I joined the army as an officer cadet. I didn’t complete my training because I was young and immature. I still regret pulling out sometimes. I collected the comic 2000AD for about 15 years. I have boxes and boxes of them in storage under the house. Please don’t take Rapture too seriously. It’s a fantasy novel and not meant to offend any religious sensibilities. If fact, I don’t consider it a religious book at all. I just love any book/movie featuring demons and angels and the end of the world. Think of Constantine. That has lots of religious elements but is certainly not considered religious. Phillip W. Simpson is an author of many children’s books, mostly for the education markets in the U.S, Australia and New Zealand. He has an undergraduate degree in Ancient History and a Master’s (Hons) degree in Archaeology. When not writing, he works as a primary school teacher. Phillip is married to Rosemarie and they live with their son, Jack and their two border terriers, Whiskey and Raffles. Rapture is his first young adult novel. This entry was posted in Author Interviews and tagged dystopia, Fantasy, Interview, Phillip W Simpson, Rapture. Bookmark the permalink.